On March 18, 2018, a presentation of books by His Holiness Patriarch Kirill of Moscow and All Russia, published by the Moscow Patriarchate Publishers, will take place at the amphitheatre of the Russian Orthodox Spiritual and Cultural Center in Paris. During the event, which will be held with a blessing of Bishop Nestor of Korsun, new volumes of the Collected Works of His Holiness Patriarch Kirill of Moscow and All Russia in the series ‘A Word to Those Who Are Near and Who Are Far’ (Series IV, v. 1, 2) will be presented. The volumes include the Primate’s homilies, speeches and addresses made during his trips over Russia and countries near and far abroad. The guests of the presentation will be also introduced to the issue collected works ‘Living Memory: Saints and We’ and ‘On Meanings’. The first of these books is devoted saints including the martyrs and confessors of the Russian Church who shown forth in the 20th century. The book ‘On Meanings’ contains Patriarch Kirill’s numerous wise thoughts on key topics of both ecclesial and secular life. Also presented will be new issues of the book series ‘In His Own Words’, which include small books with the Patriarch’s remarks on major church events of the last year. Issue 4 entitled ‘Elected by God in a Year of Hardships…: Towards the Centenary of the Patriarchal Enthronement of St. Tikhon of Moscow’. Issue 5 is entitled ‘Lessons of the Century’. 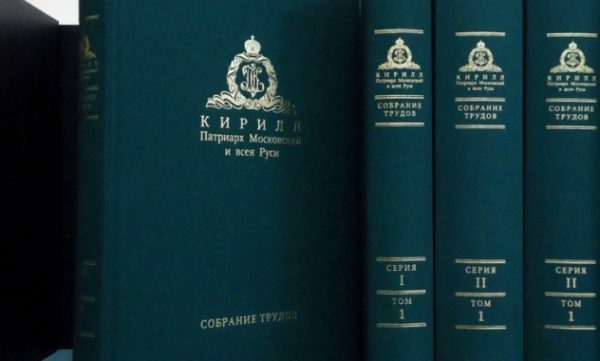 Patriarch Kirill’s books are intended for a wide range of readers as all we those who, in their social work, refer to the word of His Holiness Patriarch Kirill of Moscow and All Russia’, the site of the Diocese of Korsun reports.